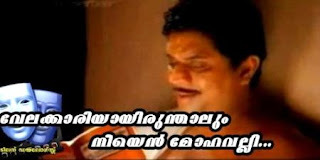 Day 211: Malayalam Movie Dialogue: Meleparambile Aanveedu "Velakkariya irundhalum"
How can I not have the great (read great great) Jagathy Sreekumar's at least one dialogue when I talk about Malayalam movie dialogues? He is an icon that no one can ever replace. Yes, the other actor who was so wonderful was Nagesh. 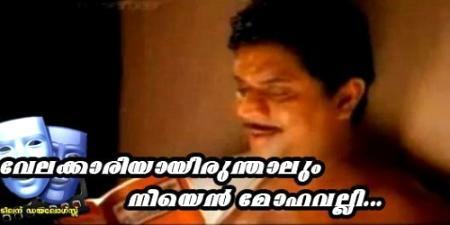 But I think Jagathy can beat all of them with ease. He can outshine every other actor on screen. Jagathy's unique touch to every role and his antics (only he can- remember, Thalavattam?) can be ONLY played by him. He must have acted in over 1000 movies and I hope he comes back to movies very soon (He met with an accident a couple of years ago and he hasn't recovered yet). Malayalam industry that was blessed with some amazing character artists. This is from the movie "Meleparambile Aanveedu" and I think the role of Jagathy as the brother of the hero (Jayaram) is just brilliant and a laugh riot. This is a scene where he is trying to learn tamil to woo the 'servant maid' (Shobana). The dialogue reads as " Velakkariya irundhalum nee en mohavalli" means "Even if you are a servant maid, you are my sweetheart"
The movie was a super hit and one of the brilliant movies in Malayalam industry. I am still researching to find out if this has been inspired by any foreign movie and haven't found any yet. So, hoping (really) that this is an original masterpiece. The attempts to remake it in Tamil (Neiyandi) was futile and did not even reach anywhere close to this brilliant one. Watch it if you haven't. You will not regret it.